An investigation into the value of symbols in vocabulary acquisition. Stockingford Infants School use symbols in the school to support communication friendly environments. The teacher, Dena, wanted to evaluate the use of symbols in learning. As part of a post-graduate study, she observed three students with communication difficulties over an 8 week period in a project to evaluate the role of symbols in acquiring sight vocabulary. The pupils all aged about five had difficulty in reading the first 45 Reception High Frequency words. 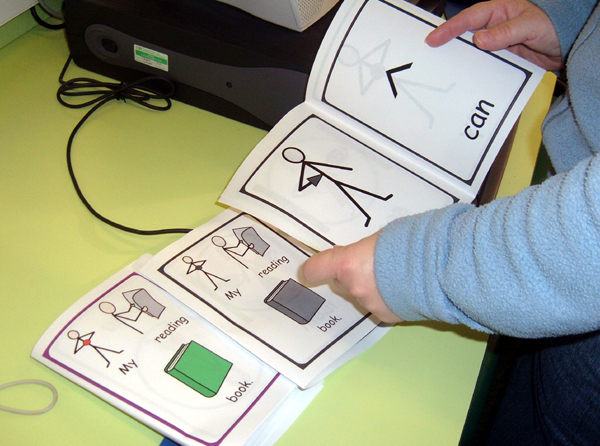 In the weekly sessions, Dena used flash cards with the words, and with the words plus symbol, in a number of games and activities during the period of the intervention. She used the vocabulary both in isolation and in connection with reading books. All three pupils made significant gains during the intervention, but the most remarkable gains were by the child with the most severe reading difficulties. Clearly these gains could not be attributed solely to the intervention and to the use of symbols. There are many other possible influencing factors, "Nevertheless, there are some observations that do suggest that the use of symbols may have had a positive impact." The indicators she cites are, that as well as recognising the words, they understand the meanings of words such as they/he/she which they were not yet using correctly in their spontaneous spoken language. When reading from the text alone they could read repeated phrases but did not always do so from word to word. However, when the symbols were present they were seen to consistently point from symbol to symbol as they read. She also reported that the children showed a positive attitude to the activities involving symbols and approached the tasks with enthusiasm. "Symbols also allowed a child with very limited level of literacy skill to take part meaningfully in activities with his higher attaining peers." Some proponents of the use of symbols in early literacy intervention indicate a concern that children could become 'dependent' on the symbols and that they should be phased out as soon as possible. Dena, however, challenges this. Although in the reading activities the children were encouraged to read the words without symbols, she feels that such a categorical statement appears unduly prescriptive. She believes that symbols contribute to an inclusive strategy, supporting visual learners by giving access to reading and information while learning to read the printed word.